Here's a look at what happened on this date in history. Today is Friday, Oct. 26, the 299th day of 2018. On October 26th, 1825, the Erie Canal opened in upstate New York, connecting Lake Erie and the Hudson River. In 1881, the “Gunfight at the O.K. 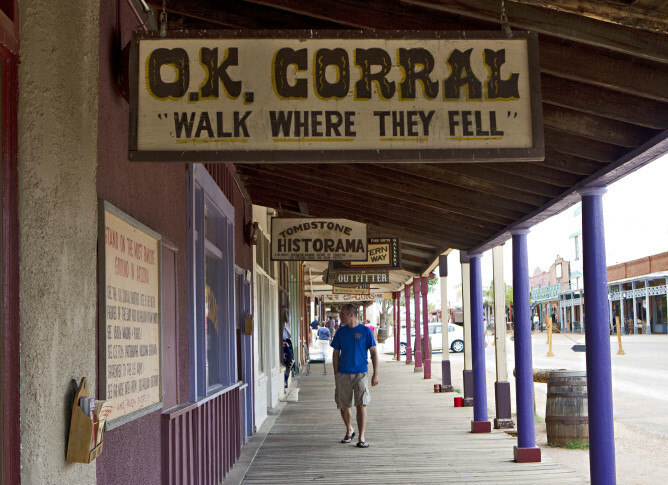 Corral” took place in Tombstone, Arizona, as Wyatt Earp, his two brothers and “Doc” Holliday confronted Ike Clanton’s gang. Three members of Clanton’s gang were killed; Earp’s brothers and Holliday were wounded. In 1944, the World War II Battle of Leyte Gulf ended in a major Allied victory over Japanese forces, whose naval capabilities were badly crippled. In 1949, President Harry S. Truman signed a measure raising the minimum wage from 40 to 75 cents an hour. In 1972, national security adviser Henry Kissinger declared, “Peace is at hand” in Vietnam. In 1979, South Korean President Park Chung-hee was shot to death by the head of the Korean Central Intelligence Agency, Kim Jae-kyu. In 1994, Prime Minister Yitzhak Rabin of Israel and Prime Minister Abdel Salam Majali of Jordan signed a peace treaty during a ceremony at the Israeli-Jordanian border attended by President Bill Clinton. In 2001, President George W. Bush signed the USA Patriot Act, giving authorities unprecedented ability to search, seize, detain or eavesdrop in their pursuit of possible terrorists. In 2006, a wildfire in Southern California killed five firefighters (investigators later determined the cause of the blaze was arson). Ten years ago: U.S. military helicopters launched a rare attack on Syrian territory, killing eight people in a strike Damascus condemned as “serious aggression.” Tony Hillerman, author of the acclaimed Navajo Tribal Police mystery novels, died in Albuquerque, N.M., at age 83. Five years ago: A Phoenix man went on a rampage, shooting to death four members of a family who lived next door to him, along with their two dogs, before turning the gun on himself; authorities speculated that the incessant noise of barking dogs drove Michael Guzzo to kill. Third baseman Will Middlebrooks tripped Allen Craig for a game-ending obstruction call on Jon Jay’s ninth-inning grounder, giving the St. Louis Cardinals a bizarre 5-4 win over the Boston Red Sox and a 2-1 World Series lead. One year ago: MSNBC said Mark Halperin had been suspended from his role as a network contributor following charges from five women who claimed he sexually harassed them while he was an ABC News executive. President Donald Trump declared opioid abuse a national public health emergency and announced new steps to combat what he described as the worst drug crisis in U.S. history. At the request of the FBI and CIA, the president blocked the release of hundreds of records on the assassination of President John F. Kennedy while allowing 2,800 other files to come out. After a decade as manager that produced just one World Series title, Joe Girardi was fired by the New York Yankees.